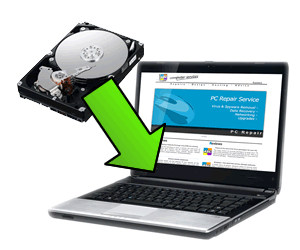 If you are upgrading your computer or adding a new PC to your home you may well have important personal data on your old hard disk drive that you need to transfer to your new machine. This can be a long and laborious task which may require specialist equipment not available to most home users. We can take your old PC or laptop, remove the hard drive and back it up to ensure all your data is kept perfectly safe, then transfer your old files, settings, emails and any other information or setting to your new machine. This service allows you to move to a new computer with the minimum of hassle, all your old files are where they always were and you can get back to your work with the confidence that all your data is safe and where you need it to be. With the vast array of programmes running on modern computers it is easy to forget how much work you have already put in to getting your computer to work the way you want it to, from simple browser customisations and family photos on your desktop, to more involved setups like accessing shared devices on a network and coping with huge email archives. When you get your new PC (which we are happy to advise on or supply if required) you will then have the task of configuring it to work like your old machine did. We can take the pain out of this operation and we also offer to remove any “Bloatware” which may come pre installed from your computer manufacturer. This will mean that you get a fast and efficient machine configured to your needs with no fuss.